Looking into the belly of the beast! I smiles as we (Kari, Mahdi, Ethan, Tyler, and I) took the first steps down South Kaibab trail, headed into the Grand Canyon. I’m always get a little giddy going here, no matter how many times I drop in, I always feel like a kid on Christmas morning! 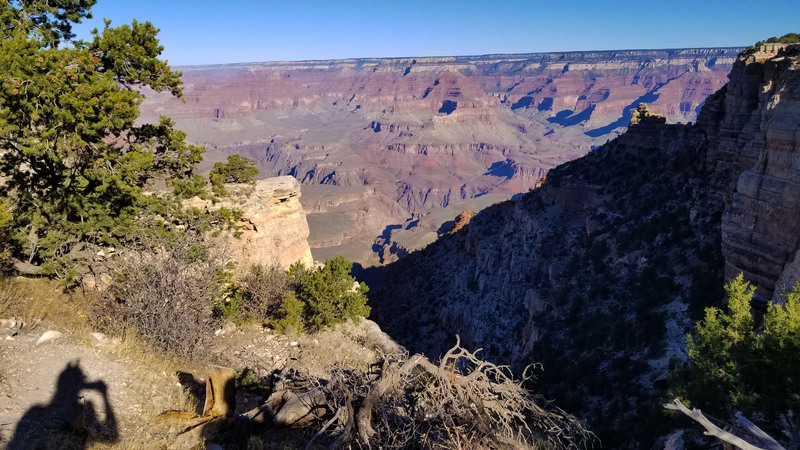 Our target for the day was to reach O’Neill Butte, just beyond Cedar Point 2.5 miles down South Kaibab trail and 1600 feet below the rim. Everyone was all smiles, and excited as ever for the day ahead! View of O’Niell from Ohh Ahh Point! O’niell Butte, finally coming into view! Packs heavy with climbing gear and provisions for the day, we trekked in taking in the sights of the vast canyon. We paused briefly at Ohh Ahh point for some pics and pointed out the buttes and temples across the canyon. What a nice day, perfect weather, great views, great company! Finally the butte came into sight. I never thought about it much before, until I started researching and found there was a 5.8 trad route on the east side that could put us ontop! It looked a bit more beastly than I remembered as we neared the base of the large formation. A little bit closer now! Just a little bit closer now! And here we are, just follow that beautiful line to the top! The off trailed a bit and soon found ourselves at the base of the story book crack climb and began to gear up. We brought two 60 meter ropes and a double rack, just to account for the unknown above. There wasn’t much information on the ascent in research we did prepping for the ascent. 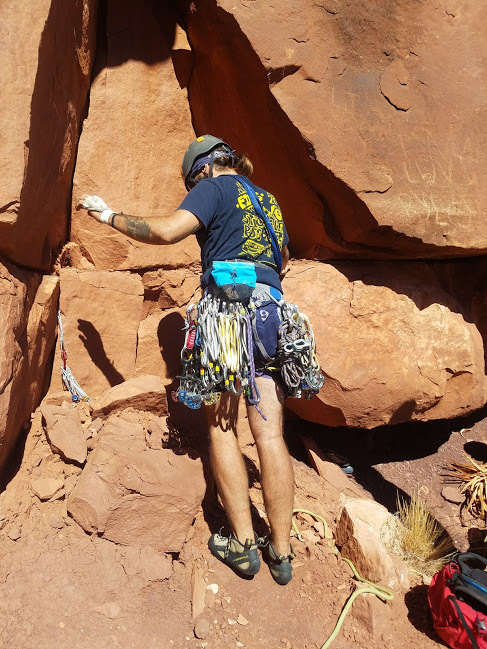 I racked up and started to tape my hands (taping your hands helps cut down on abrasions while crack climbing), and Kari began to flake (lay out) the rope and set up to belay me. I looked up at the first 10 foot climb to a ledge which would mark the real start of the climb, it was time to get moving! 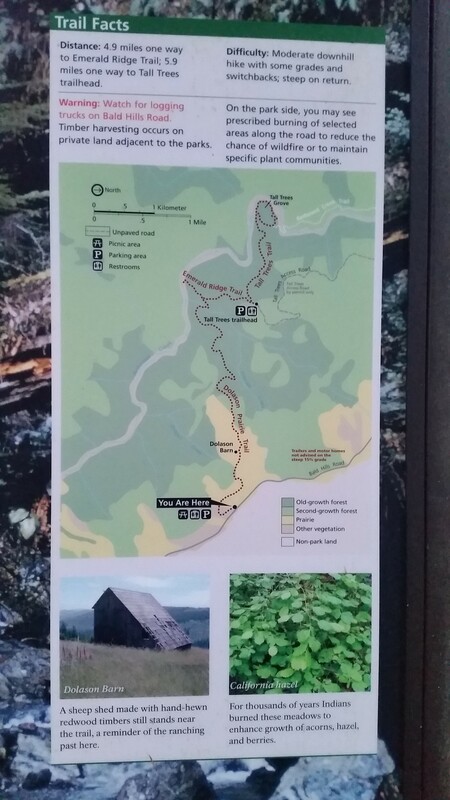 Welp, looks like we found the route! I reached up high and placed a small cam in a nice crack to get the mojo going, and I pulled a large horn to take the first ledge. As soon as I pulled up on the horn and could get eyes on the back of it, I noticed a large crack at the base of the horn. I backed off immediately! Standing back on the ground I banged on the sides of the rock again, making sure it was sold (well kind of). I once again pulled the horn and was soon standing at the base of the real climb, looking up at a 120’ crack system leading to the summit plateau just below the summit block. It was time to go to work and I jammed my fingers into the crack. Move after move, I worked my way up the crack system. I was stitching up the line pretty good, and I could feel the weight of the double rack on my belt pulling me down. 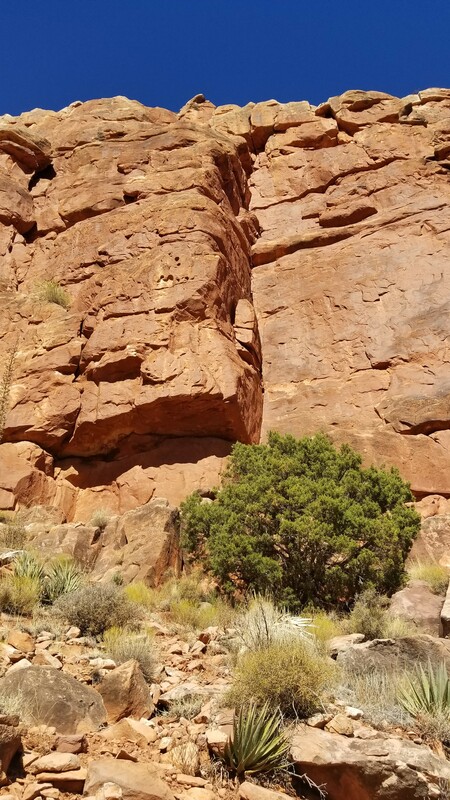 It seemed that the climb consisted of a big move across small face holds/feet with the crack to assist before you reached another good ledge and a rest. I placed a nut, and grabbing the carabiner open to release the single nut but somehow I dropped 3 other nuts!!!! They went plummeting down to the starting ledge below. I scoffed at the silly mistake, and had to choice but to keep on moving. Finally after 60’ of good crack/face climbing (without knowing it) I found the crux of the climb, a bulge offwidth section that wanted a #4 Camelot. I looked gown and all I had was small stuff up #0.1 to a #3 on me (as research failed me). I reached far far back into the crack and placed my #3 (as it was the only place it would hold), and clipped it in. The move (“The whale move” as it jokingly became known) was to stick a right fist far far back into the crack just where the offwidth became a hand jam, get a high left foot on a small chip at shoulder height on climbers left, and flop like a freaking whale to get up and over the bulge! I let out a loud laboring yell as I grabbed my left foot, helping it high (almost shoulder height) onto the small chip and pulling with my right hand to flop myself beyond the obstacle. It was like the rocks sole job was to throw me off, and it was everything I had to hold onto it . . . this was “fun” on lead! Finally I was up and through, and after a few other awkward moves I reached the base of a 15 foot crack with beautiful hand jams. I looked down and only had one more #3, there was no way I could protect the next section. The only choice I had was to build an anchor and break the long 120 pitch up into two. 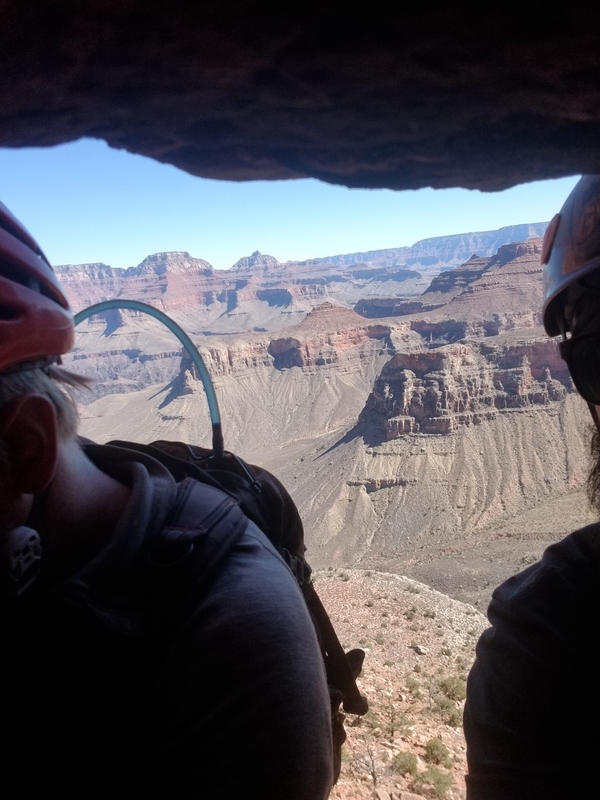 I was soon ready and yelled down to Kari “on belay, climb on!” He started climbing up, I couldn’t see where he was until finally I heard him grunting through the “whale move”. I chuckled to myself knowing he was having “fun”. He soon reached the anchors, gasping for air and clipping in. “Fun Right? !” I asked with a big smile! View from the top of pitch 1 (P1). Kari and I getting ready to swap over, take on P2! There was no time to loose and we swapped over and I began leading the next section. 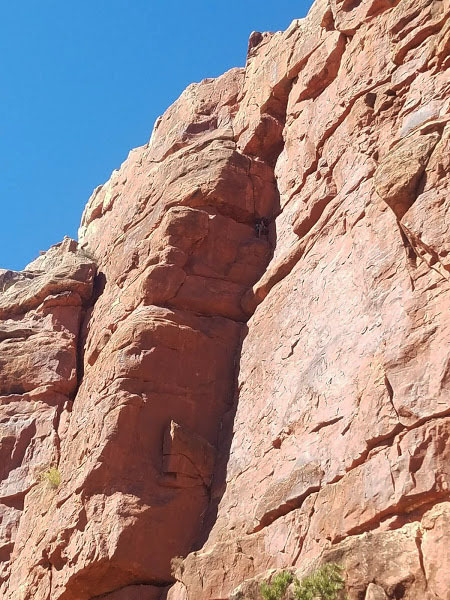 There was a 15 foot nice hand crack to an awkward transition that spit you onto a ledge that circled climbers left (south) to the actual east face. There was still a good 30’ to climb. I kept after it, climbing on placing piece after piece and after a double gaston move at the end, I topped out and let out a loud “Woop!!! 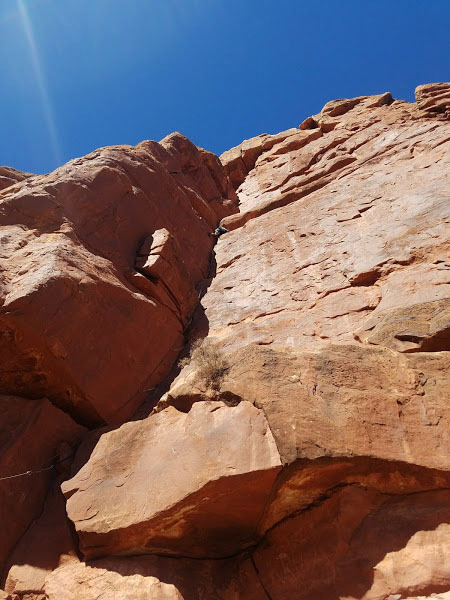 !” I set up an anchor on a large sandstone boulder towards the top and let Kari know I was safe. We then began a centipede climbing/belay style (one person belay from the top of pitch 1 (P1), then when they get there, the top belayer, belay the next climber to the top of P2) to get each climber up to the summit plateau. Tyler popped over the edge all smiles, and soon Ethan did too. Mahdi chose to take it easy and chill at the base for a nice afternoon nap. The end of the tech climbing, looking towards the summit block! Followers come one come all! Ethan, takin in the view and enjoying the climb! Kari, excited to be on the topout! Kari, taking in the views! Once the four of us were up, we headed to the north side of the plateau to reach the summit for the easy Class 3 scramble! Not too long after we were all simultaneously touching the highest rock on O’Neill Butte! With our summit complete we headed back down with hast and found a large tree to rap off of. Tying the two 60m ropes together we rappelled one at a time, quickly down almost the full length once again reaching the base of the formation. Mahdi was waiting with smiles and that fresh nap look! 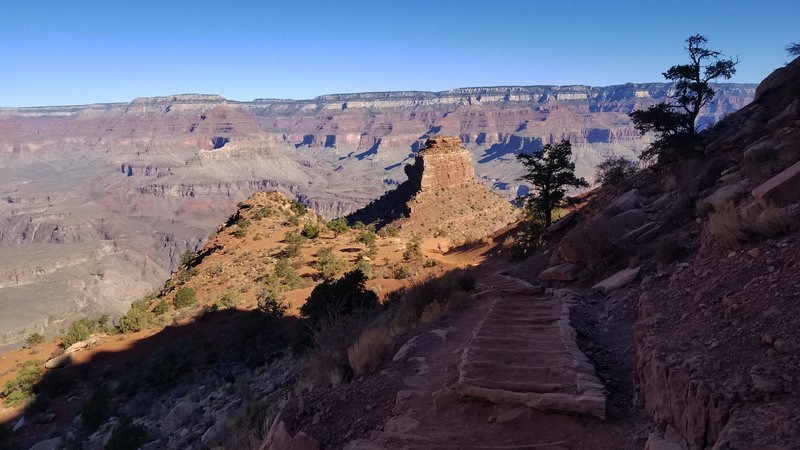 We threw on our packs and headed back up the South Kaibab trail for a nice sunset hike to the rim. What a gorgeous day, I couldn’t believe it, but we just finished all of our first technical summit ascent within the Grandest of Canyons! Tyle chill out after the descent, taking in the views! South Kaibab, our route out! Oh GC, how much you rock! Puttin down a good pace! Kari, looking a little tired, but ready to finish the push out of the canyon!